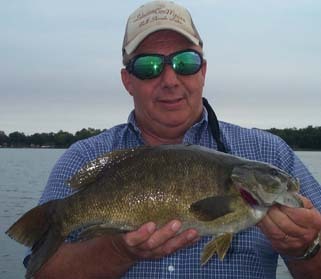 I normally fish the Tennessee River (Pickwick, Wilson lakes) for smallmouth which is only a 6hr drive. Making a 14 hour drive to fish with you (someone I’d never meet) to fish a lake I’d never heard of, made me question my decision making. I can now say that after fishing in nine states, Australia and New Zealand I’ve never felt more welcome nor have I had a better time. What can I say-after three days on the lake with you and 72 smallmouth between 3 and 5 pounds I’ll be counting the days until I make that long drive to fish with one of the nicest guides on one of the most fantastic lakes I’ve ever had the pleasure to be on. I’m coming back to look for that smallmouth that broke me off on 17 lb. test. See you this fall.